Thanks to a notification from WordPress I just realised this week in March is my third blog anniversary! This will be my 290th post. At the end of March 2013 I was advised by a blog friend to set up a Twitter page to share my blog posts and music which I did that month, in July 2013 I joined Facebook, then Google+ what an adventure, so many connections, thank you all for visiting with me, I appreciate you all spending time here. I hadn’t got a clue what I was doing when I first started writing my blog, in fact there were several months delay from when I first thought of keeping an on-line diary to actually publishing it. Who’d have guessed how much I’ve enjoyed it, meeting all of you wonderful people, learning about all your passions and seeing so many of you successfully publishing books, your art turned into silk scarves, clothing and bedding, wall art, graphics. I’ve learnt about POWs, life stories, crystals, photography, gardening, cooking, DIY, music, farming, Greece and Greek mythology, India, Bollywood, China, surfing, I could go on and on so much information, the community on WordPress is just amazing. It helps me to be a more reflective thinker and encourages me to have a real awareness of myself. I would recommend blogging even if you just want to post very infrequently but still want to keep in touch with on-line friends. This training I do is hard and very challenging and on some days when I’m emotionally drained I can always read the messages on my blog and read your blogs and get a positive boost of energy from you all. I’m very thankful and I miss it if I’m too busy to visit as much as usual. Can you believe my undergraduate course finishes in just over three months! It’s all coming to a head. My ballet module was completed successfully, I’m so happy about that. Now I’m working on a module in Italian Opera History. I also have a performance/oral examination on my submitted research project. I have no academic writing scholars in my family to pick the brains of so I have to hit the books it’s been a really steep learning curve for me but very enjoyable. One tip to any new bloggers reading, please, please, please put your blog information in your gravatar so when fellow bloggers are exploring we can click through the links easily. Some of your blogs have disappeared and I hope it’s not just the link that’s missing so if you haven’t heard from me in a while let me know. Thank you all once again I couldn’t do it without your support and encouragement. I have been thinking recently about what binds a couple together and the love that they share for each other as both my grandparents are celebrating their anniversaries in the coming weeks. Next year as it will be both their diamond and golden anniversaries I am going to try and compose a song for them and write the lyrics to celebrate what will be a wonderful occasion for them both. When I asked my Pepa why they chose the spring time to marry I expected him to give a beautiful romantic reason, however he said that it was to make the most of the tax allowances LOL. They have been very happy together and I wish them many more years in each others company. 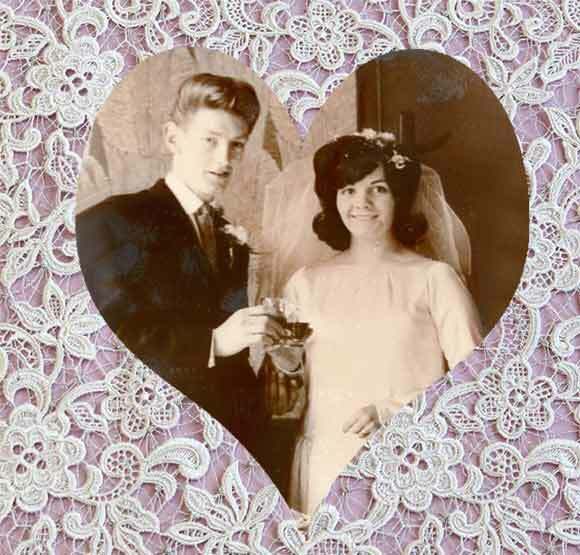 Coincidentally on the 10th April my mother’s parents will be have been married for 49 years also They met 14 months before they married, my Nana was 18 and my Grandad was 21. 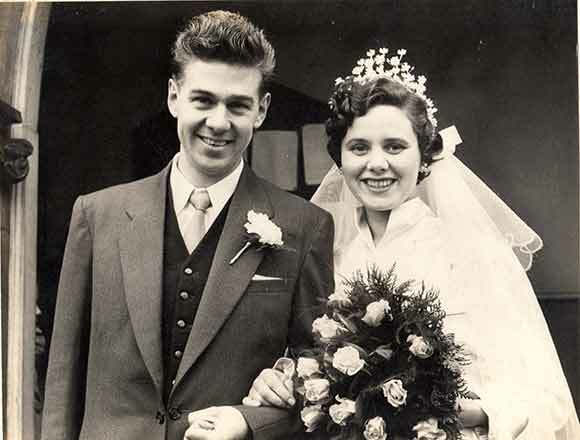 They married in Staffordshire and they had a beautiful wedding with my Nana carrying a bouquet full of pink carnations. The number one record in the UK charts on their wedding day was “Concrete and the Clay” by unit 4 plus 2.